At his daily Mass Wednesday, Pope Francis condemned the killing of Father Jacques Hamel. Some of the most heroic and inspiring figures we have met have been people who hold fast to their faith and their dignity, in spite of challenges most of us couldn’t imagine. To spend time with the Nagib family is to witness in microcosm the struggles of an entire class of people — and to realize that they are struggling not just to salvage what others discard, but also to salvage dignity and a way of life. Mrs. Nagib’s husband collected trash for a living. Now too old to work, he has passed his route on to his children. And it seems, one by one, the Nagib children are carrying on the tradition. Six days a week, Mrs. Nagib rises before dawn to see off three of her sons to their work as garbage collectors. At 5, the young men will have climbed into the family truck to head down the slopes to the city — a drive that takes two hours. There, they go from apartment to apartment along their route collecting garbage. By early afternoon, they head home, the truck loaded with trash. While the young men rest, Mrs. Nagib and her daughters begin picking through the garbage bags with bare hands. They sort the debris into piles: aluminum cans, food waste, glass, etc. Later, the family will sell the recyclables. Mrs. Nagib’s 3-year-old daughter plays barefoot in the trash heaps. Flies swarm around the mother and daughters. The sickly sweet stench of rotting waste fills the neighborhood’s narrow, unpaved streets. Read more about the Nagib family and the Zabbaleen here. How can garbage collectors and sorters who live surrounded by mountains of garbage in Cairo’s ghettoes be considered productive? How can they sing “Alleluia” at Mass on Epiphany? It is possible because so many of them look to the cross on their wrist for their cherished identity. They are not outcasts. They are not “second class.” They are brothers and sisters to Christ, and he is their Lord. For their humility, their faith, and their tireless quest for dignity, they are also, to us, heroes. To support our brothers and sisters in Egypt, visit this link. On 10 September 2016, more than 260 people attended the “Baptism by Fire” fundraising dinner in Canada in at the Madison Convention Center near Toronto. People from different parishes and different backgrounds attended — including local bishops and clergy. We gathered together for a common cause — supporting Christians in the Middle East, mainly in Iraq, Syria and Egypt. Sponsored by the Archdiocese of Toronto and CNEWA Canada, the event raised funds that will support CNEWA’s work in Syria and Iraq, and projects in Egypt run by keynote speaker, the Rev. Henri Boulad, S.J. “The testimony of selfless love is the best gift you can give.” — Father Henri Boulad, S.J. If you’d like to lend your support, visit this link. 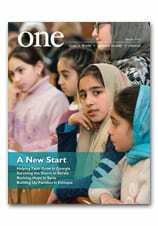 You can also read more about CNEWA’s work supporting Christians in the Middle East in recent editions of ONE magazine, including this in-depth look at displaced Iraqis and this report on Cardinal Dolan’s pastoral visit to Iraq last spring. The Rev. Androwas Bahus leads an early morning liturgy at St. Peter and St. Paul Church in the city of Shefa-Amr, Israel. That was just the beginning of his long and eventful day. Learn more about A Day in the Life of an Israeli Priest in the Winter 2015 edition of ONE. Syrians celebrate Eid Al-Adha (Feast of Sacrifice) on 12 September 2016 in Aleppo. Syria is beginning its first full day of a ceasefire brokered by Russia and the United States. In this image from 2014, Jordan’s King Abdullah II meets with Pope Francis at the Vatican. Last week, the Muslim king called on Muslims to help Christians address challenges in the Middle East. In this image from 2015, Pope Francis stands between Jewish and Muslim religious leaders during a prayer service at the ground zero 9/11 Memorial Museum in New York. As we mark the 15th anniversary of the terror attacks this Sunday, CNEWA’s external affairs officer, the Rev. Elias. D. Mallon, S.A., Ph.D., reflects on their legacy. On 11 September 2001, no one could have foreseen the Middle East of 2016, in which Iraq is close to being a failed nation; Syria is engaged in a suicidal civil war; and ISIS controls large swaths of Iraq and Syria, massacring Christians, Yazidis, Shabaks, as well as Sunni Muslims who don’t agree with them. The Islamic State’s self-proclaimed caliphate under the so-called Abu Bakr al-Baghdadi has brought wanton destruction on a scale that has not been seen since the Mongol invasions of the 13th century. Self-described jihadis have carried off murderous attacks in the U.K., Spain, France, Belgium and Germany, bringing terror to countries that had not previously experienced it. Many European countries are being inundated with refugees. The world of September 2016 has little in common with that of September 2001. While there are very few hopeful signs, there are, nonetheless, some important things that are happening and are often overlooked. In the Middle East, where Christians often simply ignored each other, there is now a new recognition of what the pope calls the “ecumenism of blood.” Threatened with extinction, many Christian churches are now working together, finding they have much in common that they may have overlooked before. The crisis in the Middle East, especially the refugee crisis, has brought an encouraging new era of cooperation between Francis and Greek Orthodox Patriarch Bartholomew. Although it has unfortunately not received the coverage it deserves, the Muslim world has also reacted with shock and horror at what is being done in its name. Muslim leaders from Iraq to Morocco to France to Indonesia have been gathering to ask themselves what is happening to Islam and condemning the violence. There’s much more. Read it all at the NCR link. Some of the children who attend the new Saint Rachel Center in Jerusalem show off their handiwork. The center — supported in part by CNEWA — cares for the children of migrants in Israel. Read more about it here. And for a deeper look into the lives of migrants in Israel, check out Surviving Without a Country in the Promised Land in the Summer 2016 edition of ONE.